Soni Razdan slammed Kangana Ranaut for attacker her daughter Alia Bhatt again and again. 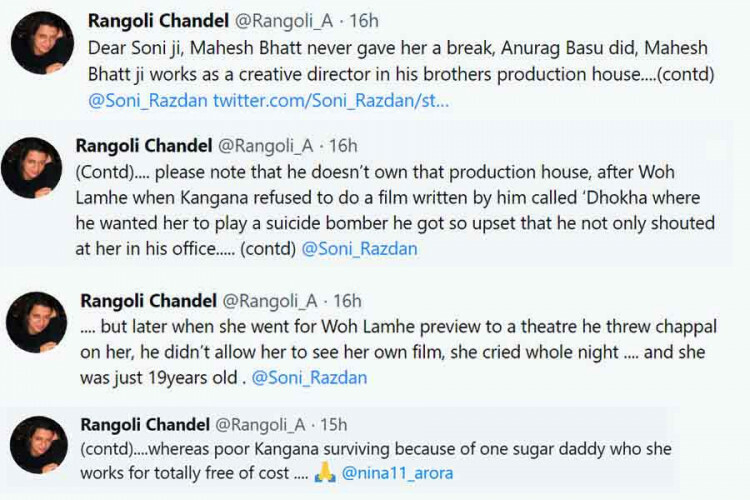 But Kangana's sister Rangoli Chandel came to back her and in a series of tweets as a reply to Soni's tweet which is now deleted said, "Mahesh Bhatt never gave first break to Kangana, it was Anurag Basu. At the screening of 'Woh Lamhe,' he threw chappal on her and didn't allow her to watch her own film. She cried the whole night."